I’m generally more intrigued by the idea of hot toddies- with their seductive alpine associations- than I am by the actual beverages. Sure, you can get a hot alcoholic libation outside of a ski town, but let’s face it: Part of the point is the ambiance. Does an Irish Coffee or Hot Buttered Rum really taste as good when it’s not consumed after a day on the slopes (ideally in front of a fireplace, or in a cozy location with slopeside views)? I also find that most bars, regardless of location, make toddies as an afterthought, and the results are often…unappetizing: Lukewarm water or food-service grade coffee, lemon wedges that have clearly seen better days, and a shot of well whiskey. Thanks, but no. While no one knows for certain where the toddy (also known as a tottie or totty) originated, it’s believed to have come from Scotland in the 18th century. While a traditional toddy is simply a combination of whisky or Scotch, honey, hot water, and lemon, the modern definition has expanded to encompass a spirit, sweetener, and warm base. Some researchers think the name is derived from toddy, an Indian beverage made of fermented palm sap, popular with employees of the East India Company. Since moving to the Aspen area, I’ve grown more interested in toddies, for the simple reason that we have some exceptionally skilled drink slingers in town, some of whom have rightfully garnered national recognition. Winter provides a great excuse for me to “research: town toddies, and below are my current favorites. Just remember: the altitude rule of thumb (every drink is equal to two) still applies, so go easy. 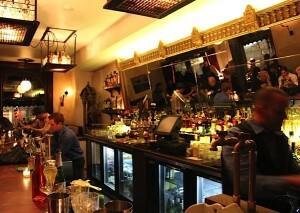 Although not affiliated with the hotel, this innovative concept restaurant now has a sister location in Manhattan. Executive Bar Director Anthony Bohlinger recently relocated back East to open the NYC restaurant, making way for head bartender Mattias Horseman. 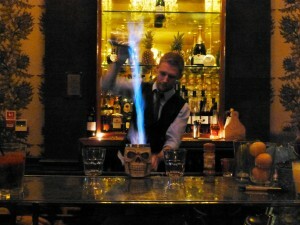 Horseman has made a name for himself by incorporating exotic ingredients (yohimbe– a purported aphrodisiac derived from the bark of a West African tree; dragonfruit; passionflower) and modernist techniques (he’s a bit of a pyro) to create distinctive- and delicious- cocktails. Try this off-menu toddy, made with Maker’s Mark, Yellow Chartreuse, lemon juice, agave nectar, and hot water. Part of the pleasure is watching Horseman prepare it; he sets it alight, and mixes the flaming concoction by streaming it between two shakers. Former bar manager (now apprentice distiller) Ryan Snow came up with this luscious-sounding toddy for a magazine story I was working on. Named after Jeff Bridges’ character in “The Big Lebowski,” (Explains Ryan, “The Dude drinks White Russians and this is a variation on that.”), it’s a blend of WCD’s smooth, syrupy, locally-grown potato vodka, muddled jalapeno, heavy cream, espresso, honey simple syrup, housemade vanilla bitters and walnut orange bitters. 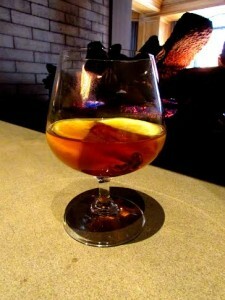 As befitting a drink inspired by a Coen Brothers film, it’s nothing short of dreamy. What would winter be without this classic? This version, created by former bar manager Joshua Peter Thomas, is amped up and enriched with Bacardi Oakheart Spiced Rum, housemade spiced vanilla bean ice cream, brown sugar, whole egg yolks, and butter. Sure it’s more like dessert, but that’s part of its appeal. High tea with the traditional accoutrements (scones, jam, finger sandwiches) is a thing at this sedate spot with the oversized fireplace. If you’re in need of a nip, however, try this sophisticated beverage made with Maker’s Mark, agave nectar, walnut bitters, and hot water. If you happen to be commuting to/from Aspen and have some time to kill, do yourself a favor and drop by Cooper Lounge, in the newly renovated Denver Union Station (note you’ll need to make a reservation, even if it’s same-day). Bar manager Marcel Templet is nothing short of a genius when it comes to making cocktails, and his Café con Leche (Tequila Ocho Reposado, Dancing Pines Zoranj, NOVO iced coffee, piloncillo syrup, whipped cream) is seriously one of the most heavenly beverages I’ve ever had. You’ve been warned.